I shared my skincare routine last in August 2017, and said I’d make it a more regular segment here on the blog, if only for my personal reference, to remind myself of what works (and what doesn’t). 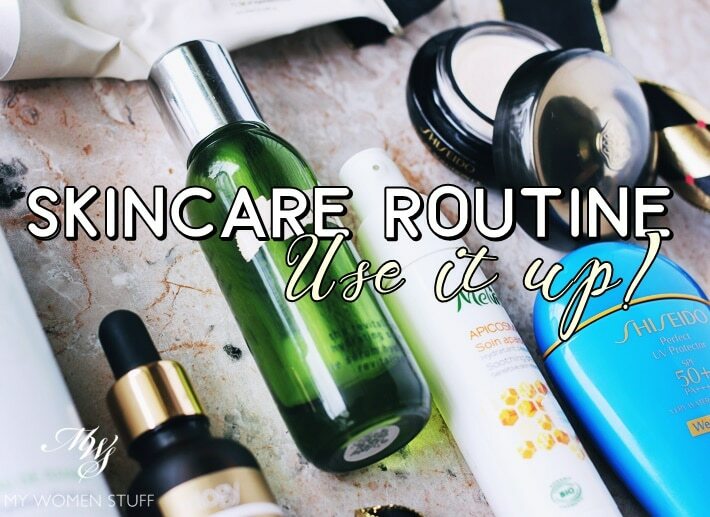 What you may notice is that while the products will switch around and change from time to time, the structure of my routine remains pretty much the same, which is what makes it a “routine”. In August, I was all about calming down my skin that was feeling sensitive. By September, my skin was calm and zen, and I was ready to play around again. But I set myself a goal. I had a bunch of skincare that were either on their last legs, or almost expired, and I gave myself a challenge of either using them up, or tossing them out. Where the products have been reviewed, links will be given to the review so you can read my thoughts in full detail, find out prices and where to buy etc. This is an overview with some additional follow up thoughts. After getting my skin back to normal from its sensitive self, I decided that it was time to start clearing out the random bits of skincare I had left behind. I often find I leave random remnants of skincare lying around, and I wanted to clear my dresser. The Antipodes Grace Gentle Cream Cleanser is one I like, with a scent that always, without fail, reminds me of a steaming hot “pau”. Makes me hungry everytime! LOL I like the texture and how lovely it makes my skin feel, and how hungry it makes me in the morning. But I’m not too crazy about the packaging. I’d prefer if it came in a pump packaging instead of a tube. Like toothpaste, by the time you reach the end of the product life, it gets harder and harder to squeeze out product. It’s empty now, but I like it, and I have a back up now. Yay! So yes, it’s a repurchase for me! I spritz out the last of my Caudalie Grape Water Spray just 2 days ago, and I was a little sad about it. This is soothing and calming and adds a little moisture to the skin. It makes a nice base for oils that follow and acts as my “toner” step. This one’s an empty, and it’s a repurchase because I have a spare waiting in line too! I can’t help noticing how quickly I used up the La Mer The Revitalizing Hydrating Serum after my August post. I had about a quarter of the bottle left there. Now, it’s all gone. Every last drop! I’ve had this since January, and I used it for about 2 months straight before scaling back, because it was running out and I loved it so much. I feel like the La Mer serum gives my skin an additional boost of hydration and to get over dryness or sensitivity. But I also felt that because I loved it so much, I owed it to myself to finish it. So I did. It’s all gone, and I’m a little sad looking at the empty bottle. I would love to repurchase because I love it that much, but the cost is rather prohibitive, and for this reason, I’ll bid it au revoir for now – till I scrape up enough moolah to buy it again. My skin loves the Melvita Apiscoma cream especially when it’s feeling sensitive or just off kilter. I would love to keep this as an emergency skin cure, but I also realised that because it’s an organic product with a short shelf life, I wouldn’t do it any justice letting it expire. So, I’m using it up right now. Just a few more uses left. Yes, it’s a repurchase! I’m lax about eye creams, but some time in September, I was invited for a very exclusive event to introduce the luxury range of Shiseido Future Solution LX, and because I don’t have an eye cream in my routine, I slipped it in immediately. I quite like it. It is thick and creamy, but does not give me oil seeds, nor clog my pores. It feels comfortable and with regular twice a day use, seems to help depuff my tired eyes, make my eye bags look less red, and give a little lift to my lids. I’ll post in more detail in a later post to come. I had finished the Hydrofresh version, so I went back to the regular Shiseido Perfect UV Protector. This is still my first pick for sunscreen, despite the hefty price tag. I tried one from Senka in the middle of the month, that comes highly raved, but felt it didn’t protect my skin enough. I detected some new sun spots that did not make me happy. So I’m back to this Shiseido one. I might have found a substitute, but let me try it more and let you know later! For the night, I too dug out some old products I’d almost used up, to clear out. I really did not want perfectly good products going to waste! I told you about the Estee Lauder Advanced Night Micro Cleansing Balm a while ago, and I said that it was a decent product. But you are better off sticking to its clone, the Clinique Take The Day off balm cleanser, which has more product in there and better bang for your buck. Once I scraped the bottom of the tub, I was actually quite shocked at how little product there is in the tub. The base of the tub is about halfway from the bottom of the packaging, which is very deceptive. As a product, it is decent, but because it’s just too expensive for so little product, I will not repurchase. As I told you before this, you’ll be seeing quite a lot of the Cerave Hydrating Cleanser, as I’m working through it, and it’s gentle enough for a second cleanse if and when I need it. I forgot the mist in the picture, but it’s the Caudalie Grape Water spray again, to hydrate the skin and to act as a toner. I decided to see if I could do something to lighten my pigmentation (the Senka sunscreen did not cut it!) and found the Odacite Papaya and Geranium serum for hyperpigmentation in my stash. I tried using it twice a day as recommended, but I have a suspicion it makes the problem worse (I’ll elaborate on this later) so I kept it to only for night. 3 drops, because its supposed to be potent. Will update in a separate post. While waiting for the oil to sink in, I go in with the eye cream again. This is one of the few times that I’m actually hardworking about eye creams! Partly because I do like this, and the creamy texture that sinks right into my skin nicely. The Genaissance de La Mer The Serum Essence is something I told you about quite a long time ago. A premium range in the already premium La Mer skincare range. I’ve been a little hesitant to use it, because when you have a very expensive product, you keep wanting to “save it for something special” which usually never comes LOL! So, I decided I’d finish up what’s left of it. On alternate nights, or about 3 times a week, I give my skin a break and do a reset. These are the 2 products I use. I use this after cleansing and the mist. 5 drops warmed up in the palm of my hand and massaged deep into my skin, and that’s it for that night. Read the review, and read this post if you want to know more about why I do this and why I use this oil. This bottle is a repurchase and I will keep repurchasing! Righty then, do you have any questions on the products or my routines? How about sharing your empties! NEXT POST: Does the Bobbi Brown Instant Full Cover Concealer really fake you having 8 hours of sleep? -hada labo premium lotion (use abt 3drops with Cotton pad. I keep all my empties in case if there is any exchange or promotion. I have exchanged Nutox serum, not really an exciting product in red bottle so I gave it to my mum but she raved about the moisturising effect it has on her scaly skin on arm. It does calm the skin from redness and itchy dry skin from menopause when the lotions I gave her didn’t help her much. Not bad at all. Vitamin C and glycolic acid have diminished many of my brown spots and made my complexion more even. Tried Shiseido Future Solution range few years ago. I dont like the sweet bubble-gummy scent, and i didn’t liked the thick texture back then. Maybe now my skin will like it more. Maybe I should give Caudalie Grape Water a try. My skin is super dehydrated. 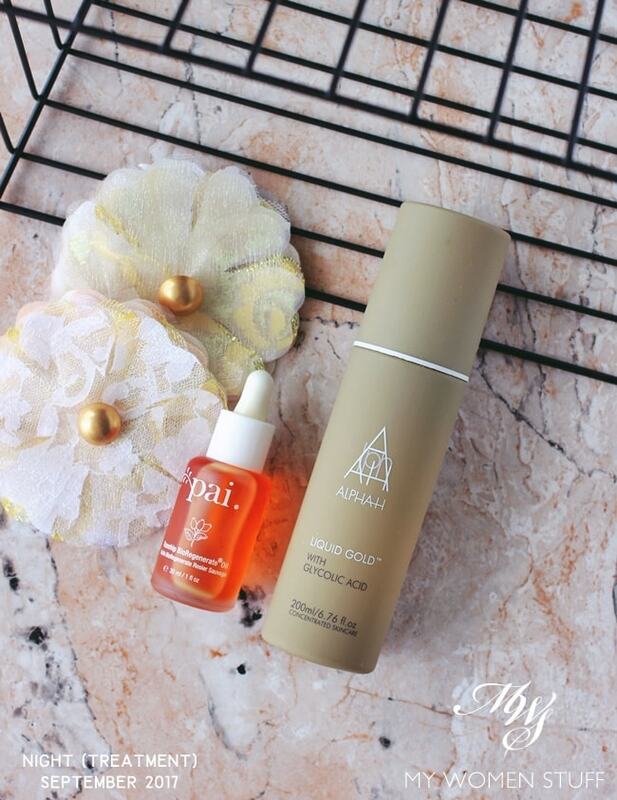 Hi DK Thanks for sharing your routine and what you’d repurchase (or not!)! Ooh I’ve heard so much about Drunk Elephant products. Haven’t tried any, because they were hard to get hold of, but after the initial hype, I’m starting to hear more rumblings of discontented users. So maybe I’ll be less interested. I remember using the Sekkisei sunscreen once too. It wasn’t bad, that I can recall 🙂 I have to try some Paula’s Choice – I hear some of the products are really good! 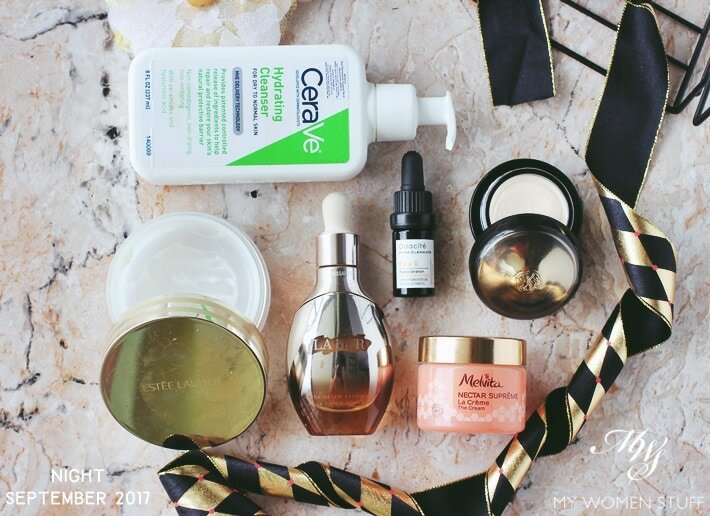 Thank You for sharing with us your September routine! ? Glad you enjoyed it. What was yours like? LOVED looking through the photos you posted on IG on your routine, even happier that you blogged about it! I’m really happy that you too find the Shiseido sunscreen a good one. I’ve wandered around but can’t seem to find a substitute for this one either. I guess my wallet just has to cry once every 2 months or so LOL! Oh and Dr. Lewinns cleansing oil is SO GOOD! I’m back on cleansing balms, but thanks for reminding me. I might pick one up as an alternative. Happy you like it too! I haven’t heard of Go-To actually, but you’ve got me intrigued! Love this post :-). I think I have posted up my routines in your August post so wont be posting it here again. I purchased a few similar products such as Caudalie Grape Water Spray, Trilogy LE oil & Melvita Apiscoma Cream due to your recommendation. Love all these picks. Lol. Just wanted to add that acid toning with Pixi Glow has improved my skin. I used to acid tone everyday except on days when I used Alpha Liquid Gold but it dried out my skin. I decided to change my routine after reading a comment from your reader in your August routine post. So my routine now is acid tone 3 times a week in the mornings, use Alpha Liquid Gold twice a week & for 2 days a week (after Alpha Liquid Gold days) I dont acid tone. Also added Hylamide Vit C (which I bought via ASOS-thanks for recommending that website) to my skincare. So my skin is brighter now with less breakouts. I am liking the Trilogy Oil & will consider using the Pai one soon. Both Trilogy & Pai also have anti-aging ingredients? Love love your postings, Paris B. I have bought the Melvita products after reading your post and love them. But can you explain exactly what is acid toning? Thanks and looking forward to more postings! Hi Gina, thank you for your support and I’m happy that the Melvita recommendations have worked out for you! Acid toning is a bit of a general term. It basically means using a toner (lotion) that contains acids like AHA (lactic which is more gentle or glycolic) or BHA (salicylic) on skin. This gently exfoliates the skin and preps it for receiving other products you use. Hope this helps! Checking out other people’s routines is a great way to discover new products. I will have to try some of the Antipodes products and the Pai oil. Hylamide SubQ Anti-Age serum and the NIOD Copper Amino Isolate 1% (I use them on rotation) SkinCeuticals Brightening UV Defense and their Mineral Radiance UV Defense tinted. Second cleansers are always changing, but I do tend to gravitate towards REN, I like the Clarifying Clay Cleanser and Alpha H Balancing Cleanser. I have combination skin that used to be very breakout prone until I figured out which products to use. Moisturizers change all the time as well. I’m currently using the Time Bomb Powerball Intensive Moisturizer and Murad Hydro-Dynamic Ultimate Moisture, both are wonderful. I also love Perricone MD Hypoallergenic Nourishing Moisturizer, but don’t like spending too much on a moisturizer, so I’m always on the lookout for more affordable ones. The Murad one is also on the expensive side, but I got it on sale and it’s really good, and will last a long time. I think it might be a keeper. Hi Ivana, thanks for sharing your routine! Like you, I too love seeing what others are using because you never know if you might find a new favourite! 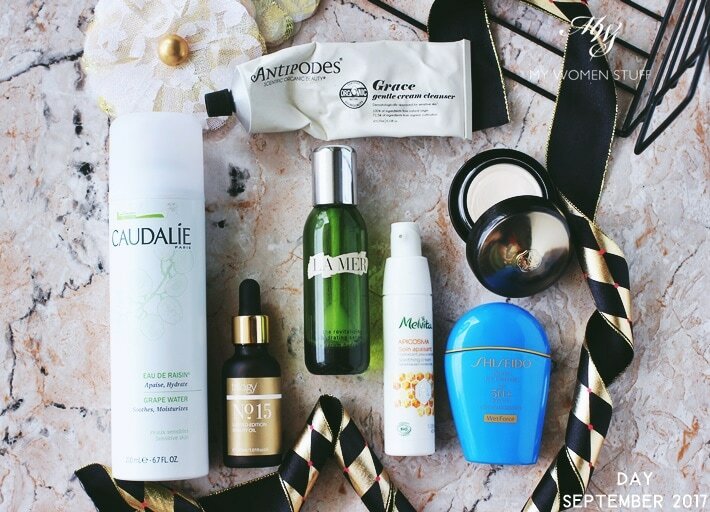 I’m looking at your list of repurchases and nodding in agreement 😀 I too love the same things you do, except the Caudalie oil (haven’t tried it before) and the Hylamide SubQ serum (wasn’t too impressed) and NIOD CAIS (haven’t yet tried). Oh I love REN products – their cleansers are always so lovely! I gravitate to cream cleansers and they make really nice ones. I’m trying the Murad Overnight Detox Moisturiser, and you know, it’s not bad! A little pricey though. All of the products you haven’t tried or were not impressed with work better for oily or combination skin. I find that they prevent breakouts and help my skin heal faster when an occasional zit appears. I know some people with dry skin that love the Caudalie oil, so you could check that one out, but it has a dry oil feel, and if I remember correctly you don’t particularly like those 🙂 Will try Murad Overnight Detox Moisturizer sometime. Thanks! True, although I wish I knew about some of these products when I was in my 20s. I think sensitive and reactive skins can benefit too, no matter how young (minus heavy oils and anti-aging stuff of course). Thank you for taking the time to reply. Looking forward to more posts like this. Tell me about it! I suffered through a face full of acne as a teen and in my 20’s. Wish I knew better then what I know now! 🙂 There will be more posts along this line to come for sure! Sharing mine since a reader mentioned it’s a great way to discover new products. My pm routine since am routine is simply to slap on any moisturiser and Biore sunblock before rushing to work. The EH vitamin C cream sample I got from Caliata.com website. It has the signature heady jasmine oil smell which mask off the Kiehl’s citrusy smell. 1) Premix the balm and water in palm before spreading it to face. Nope, it doesn’t work. 2) Use it neat to spread the balm to fast and attempt to emulsify in the shower. Skin stays greasy till I rubbed them off with muslin. 3) Spritz my face damp with water and spread the balm onto the skin. Balm immediately turns milky white. Very easily washed off with water. Have you stop using the Dr Brandt vit C serum in your daily routine?Can’t wait for your review abt Odasite serum..anything on pigmentation,I’m curious?. The latest empty I’m upset about is the Anessa sunscreen but I still have the WetForce as back up. My friend in Singapore picked one up for me at Watsons though. Yay! It’s SGD39.90 and sometimes there’s promo of buy 2 get 1 free. So when there’s this promo, she knows to buy it for me asap without asking. LOL! Oh that’s affordable in Singapore! I’ve been using it for a while, and I do like it a lot. But when I went back to Shiseido just to compare, I did feel like it felt and looked better somehow LOL But it definitely is better protection for my skin than Senka that everyone was raving about. That one I felt did my skin no service 🙁 It was cheap though. Wow, glad to hear about the good reviews for Sulwhasoo coming from the beauty guru 🙂 I have been using them for the past month, and I like them a lot – I get better-rested skin 🙂 Only downside is it is definitely way more expensive than Laneige! Also, Olay has always been a staple favourite for me for their creams – I still remember that tub of pink cream years back!